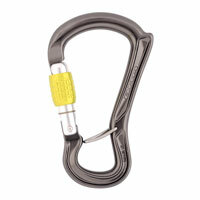 Locking carabiners are among the first items of equipment that climbers purchase. It could be that your gym requires you to have a locking carabiner to attach yourself to the gym's belay stations or climbing ropes. Or, you're just starting outdoors and you need one for your belay device or for your personal attachment sling to clip into anchors. When I first started climbing, my first locking carabiners all had similar characteristics: I was always after chunky, beefy carabiners with a solid top bar and a wide basket. Besides that, I liked to keep things simple. Solid screwgate. That's all I needed. 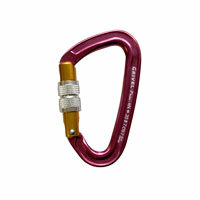 I first encountered 'fancy' carabiners when I won a DMM Revolver at a REEL ROCK Film Tour screening in Melbourne. The Revolver is designed to help reduce rope drag. It does this with a pulley that's incorporated into the basket of the carabiner. I thought it was a clever idea, and this opened my eyes to different carabiner designs. Ever since I started working at Bogong Equipment, I've been exposed to lots of different types of carabiners on a regular basis. I have a few favourites now, which I've decided to share with you here. The DMM Belay Master 2 Carabiner was the first belay-specific carabiner I purchased. What motivated me to get it was feeling tired of looking down at my belay loop to notice my belay carabiner cross-loaded to all hell. Eventually, I decided I wanted a directional belay 'biner. The Belay Master 2 fills this function. It's a regular screwgate locking carabiner with an unusual plastic flap that clips onto the gate when it's in a locked position. Because it only clips on when the gate is locked, it's also useful if you're a serial forgetter when it comes to locking the screw mechanism. But, that's not its only drawcard. The DMM Belay Master 2 carabiner feeds the rope really well, with a smooth paying out action. So much so, that it was noticeable after years of using other carabiners. Safe, because you can tell at a glance if it's locked (since the plastic clasp only connects if the screwgate is in locked position). I got the Grivel K3N Plume Screwgate Carabiner because it's probably the tiniest screwgate made for climbing that I'd ever seen. You have to hold the Grivel K3N Plume Screwgate in your hand to appreciate how small and light it is. It's 37 grams (a regular DMM Aero HMS, for comparison, is 85 grams), and a miniscule 90 millimetres long. Surprisingly, the K3N Plume is rated to 20kN (gate closed), which isn't outrageously far off the (much bigger) DMM Aeros HMS' 25kN. So, the Plume is a fully usable screwgate. Although, I'd be nervous belaying with it. Of course, that's not what it's intended for. I find it really useful for rigging belays off anchors with bolt-and-chain configurations that you'd typically struggle to get a regular, beefy screwgate through. 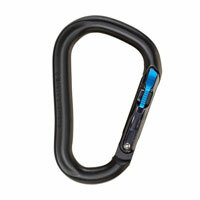 Has fewer applications than a chunkier, all-round locking carabiner. Which means you're going to the trouble of carrying something that can be used in fewer scenarios. 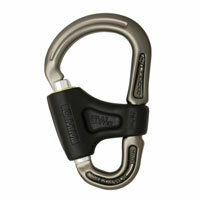 SIMILAR: A comparable carabiner to the Grivel K3N Plume Screwgate is the DMM Phantom Screwgate. The latter is only marginally heavier (42 grams vs. the Plume's 37 grams) and marginally longer (about 94 millimetres vs. 90 millimetres). Yet, the Phantom Screwgate is rated to a stronger 24kN (vs. 20kN). However, the Plume has slimmer screwgate barrel, which seems to be a benefit in real-life handling. Black Diamond's Magnetron RockLock is my favourite locking carabiner for using at the end of my personal attachment sling. Released in around 2012, the Magnetron was a big deal when it arrived on the market because it was the first carabiner to use magnetic technology in its locking mechanism. Instead of a regular screwgate closure, or double- or triple-lock closure (both of which can be fumbly to open with one hand if you're not used to them), the Black Diamond Magnetron has a special gate that is unlocked by squeezing two magnetic catches with your thumb and forefinger, simultaneously. It's very easy to operate with one hand, which makes clipping into an anchor – particularly on sport routes – swift and easy. And, because it's an auto-locking carabiner (it locks if the gate is shut), you don't have to worry about forgeting to screw the gate shut, as you might with a regular screwgate. One of the pricier options. At crowded belay stations, I get nervous thinking about a scenario in which the two clasps might happen to get squeezed between the rock and a neighbouring carabiner or taut rope and open the gate – but, this has never actually happened to me and practically is unlikely. Apparently the Magnetron has trouble opening in cold weather, but I've not used it in particularly frigid conditions, so I can't comment on that. I don't officially own one of these, but my partner has an Edelrid HMS Strike Slider (a similar version of the carabiner pictured here) that he uses on the end of his personal attachment sling. At a glance, the Slider closure looks like a normal straight gate. But, it's actually an auto-locking gate, which only opens when you push down on a latch on the outside of the gate. Compared to the Magnetron, it's a slightly different shape. It's also lighter, at 66 grams (vs. 87 grams). The Edelrid HMS Strike Slider FG isn't as beefy as the Black Diamond Magnetron, but it's still a solid carabiner. FYI, the Edelrid HMS Strike Slider FG also comes in a Slider Safelock version. The difference – aside from colour – is that the Safelock version's main gate can't be opened unless the internal wiregate is also open. The trade-off is that this makes it difficult to open one-handed – but, it's incredibly safe. There's also a third version – the one my partner has – which has no internal wiregate at all. Not a great deal, to be honest. To nitpick, I'd comment that it's a little uncomfortable for my small hands to operate – but, not to the point that it's a deal-breaker. The DMM Sentinel HMS Screwgate Carabiner first came to my attention when climbing photographer Glenn Robbins told me that it's one of his favourite carabiners. His reason? The deep basket comfortably accommodates two clove hitches, which makes it a nice rigging carabiner. For its strength (24kN gate closed), it's also very light (54g). 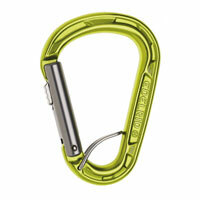 DMM shaved weight in the beam design, which makes it quite a slim carabiner. In fact, because of the Sentinel's slender top bar, I use the triple-lock version on my two-year-old daughter's body harness, which has attachment points that are quite tight when you're required to use two locking carabiners (for instance, at a climbing gym). Deep basket takes two clove hitches. Generous rope radius means it's ideal if you're using double ropes. As a belay 'biner, it's not as chunky as I'm used to – but, that's a personal preference. 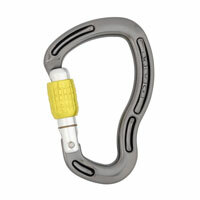 The DMM Sentinel is designed to be used with the DMM Bugette belay device, so it's perfectly able as a belay carabiner. The DMM Ceros Screwgate Carabiner is – quite possibly – the best belay carabiner ever created. By anyone. Anywhere. 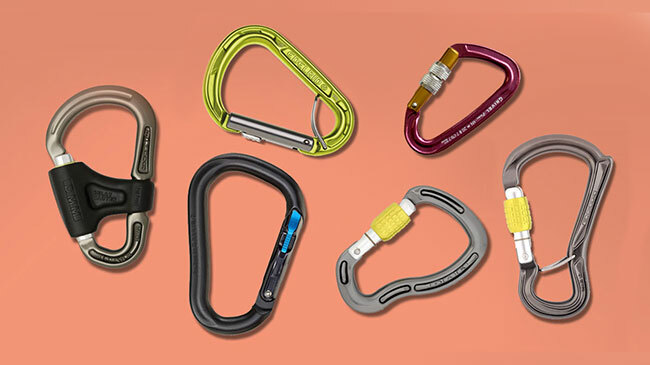 DMM combined the best elements from its best carabiners to create one 'biner to rule them all. Firstly, it's directional, thanks to the internal wiregate that allows the 'biner to snap onto your belay loop. Because the internal gate opens inward, clipping it to your belay loop is a swift, one-handed action. The second feature is a horn, which is the same horn seen on the DMM Rhino Carabiner (yes... rhino + ceros = you get the picture). This horn helps prevent some belay devices (a Petzl GriGri, for instance) from sliding onto the carabiner's spine. The rounded, full-section top bar is robust and enables smooth rope handling. Robust top bar for smooth rope handling and durability. Horn prevents certain belay devices from cross-loading. Honestly, we have yet to find one. There you have it. My six favourite locking carabiners. Be sure to check out our entire range of carabiners for climbing.